Jennifer, a children’s writer living in Charlotte, North Carolina, is a graduate of UNC Charlotte and a former middle school and high school English teacher. Jennifer has self-published her first picture book, Lost Soles, a story about a pair of flip flops, Flip and Flop, that get separated from each other after a day at the beach when Flip flies off the beach cart and gets left behind. Will Flip ever see his “sole mate”again? The idea for her story stems from her fascination with lone shoes seen on the sides of roads, along the highway, and in other random places. Jennifer began taking pictures of these lost soles over ten years ago, creating a portfolio of sandals, boots, flip flops, heels, and more. She wanted to know their story and how they’d come to rest alone in such odd places. 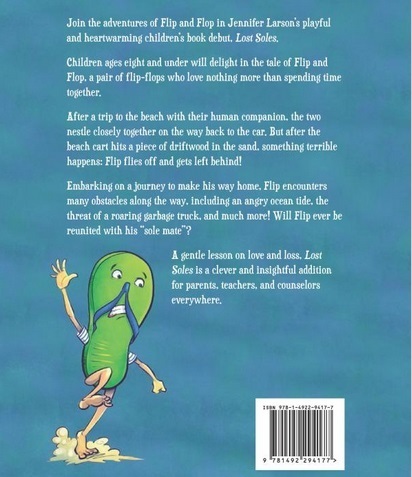 Lost Soles chronicles the journey of one such shoe and imagines life after the separation from a “sole mate.”Jennifer’s book was released in November 2014 and is available at Amazon.com. Currently she is working on two other picture books manuscripts. “After a 14-year teaching career, I stepped away from the classroom to pursue writing, but I had no idea where to begin. One afternoon I searched the web for writing classes in Charlotte when I stumbled across something that caught my eye: Maureen Ryan Griffin’s Wordplay. When I searched her site, her Gift of Memoir class sounded ideal. The only problem was that the 8-week course was already in progress. Seeing as I had only missed one session, I took a chance and called to see if I could still get a spot. Maureen promptly returned my call and told me that when she heard the excitement in my voice mail, she had a positive feeling and knew the class was for me. Maureen eagerly invited me to join.